This book, which is part of the popular Royal Diaries series, focuses on a young Korean woman who will one day inherit her father's kingdom, despite the fact that only males have ruled in the past. Visitors from neighboring countries look down upon her father for this decision and upon Sondok herself for her "inappropriate" interest in reading the skies. Sondok expresses her feelings to her deceased grandmother by writing messages and slipping them inside her grandmother's ancestral jar. This book provides many interesting insights into Korean culture in the late 500s. Young readers will learn about the relationship between the Three Kingdoms of Korea, as well as Korea's relations with other nearby nations. They will see the way gender roles are enforced and challenged, and the way family dynamics determine the behavior of children in royal families. 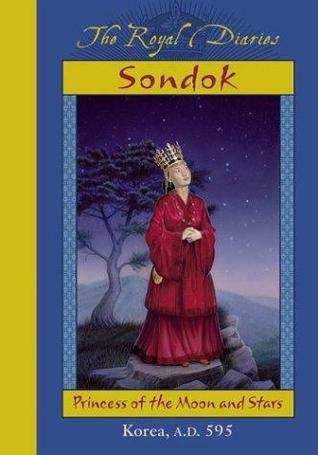 In the author's note, they will learn that Sondok was a real person, and that although some of her childhood details are the product of the author's imagination, she did go onto rule as the first female monarch of her kingdom and the second female ruler in all of East Asia. More than most of the other books I've read so far, this one is a history lesson unto itself. There are some problems with the book. Though Sondok's way of keeping time is probably historically accurate, it's a little hard to follow the dates of her "diary" entries when you're used to modern Western calendars. Some subtle explanation early on in the story would have helped a lot. The entire diary concept is weak, too. It struck me as highly unlikely that a young woman with such respect for her grandmother would feel comfortable placing personal notes in her ancestral jar. Obviously, this entire series is devoted to diaries, so it was not necessarily a storytelling decision specific to this character and setting, but it does make parts of the story feel false and gimmicky. These issues aside, though, this book is really an excellent and enjoyable read, especially for science-minded girls seeking stories focused on their interests. Based on this book, I would say that the Royal Diaries is a much more valuable and well-written series than I would have guessed at first glance.